Jedi Mouseketeer: Disney Channel Sets Premiere Date for "Wizards of Waverly Place Reunion". Disney Channel Sets Premiere Date for "Wizards of Waverly Place Reunion". A one-hour special on Friday, March 15 at 8/7c. 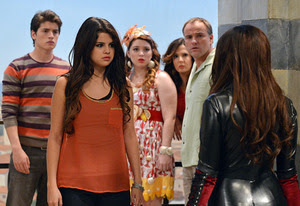 Selena Gomez is back to star in and executive produce the event, dubbed The Wizards Return: Alex vs. Alex. In the special, the Russo family and pals travel to Tuscany, Italy, to meet relatives. But while attempting to prove that she's serious about her craft as a wizard, Alex (Gomez) accidentally conjures up a spell that splits her personality into two — a Good Alex and an Evil Alex. The two dueling Alexes eventually battle over the fate of her family and mankind atop the Tower of Pisa. The Wizards Return: Alex vs. Alex also stars Jake T. Austin, Jennifer Stone, Maria Canals-Barrera, David DeLuise, Gregg Sulkin and Beau Mirchoff. The original Wizards of Waverly Place ran for more than 100 episodes and earned multiple Emmy Awards. It was also the No. 1 series on TV among kids 2-11, kids 6-11 and tweens 9-14 during its run. More content can be found at disneychannel.com/wizards. The Wizards Return: Alex vs. Alex will first debut Friday, March 8 on Disney Channel On Demand. The special will be available for iTunes download starting Tuesday, March 19. Vince Cheung, Ben Montanio and Dan Berendsen wrote the special, while Victor Gonzalez directed.